evaluates … [ERIC’s] partnership between seven pioneering states–Colorado, Delaware, Maryland, Nevada, Utah, Virginia, and Washington–facilitated by The Pew Charitable Trusts. 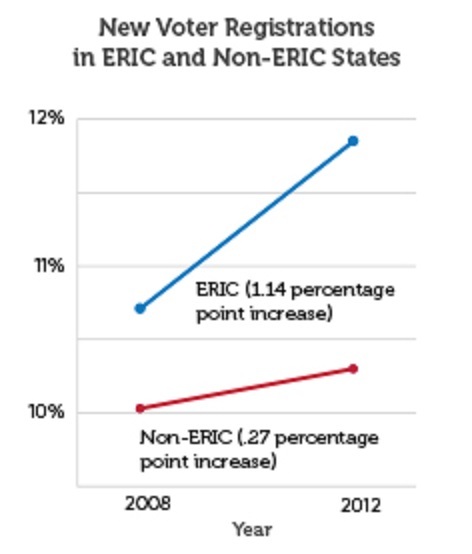 ERIC promotes more accurate and complete voter lists through improved data sharing among states, and the RTI research found that the system had a positive impact on the 2012 elections in participating states. ERIC compares participating states’ voter and Department of Motor Vehicle records, and looks at data from the U.S. Postal Service and death records from the Social Security Administration. This allows ERIC states to identify voters who moved, died, or have duplicate registrations, and those who may be eligible to vote but are unregistered. In 2012, the seven ERIC states used these data to send postcards to 5,701,048 eligible but unregistered individuals inviting them to register. As a result of this outreach, 5.4 percent of those contacted registered to vote. + Increased their new-voter registration rates by 1.14 percentage points, compared with just 0.27 points in non-ERIC states. + Experienced a 3.39-point decrease in the rate of individuals citing registration problems as their reason for not voting, compared with a 0.57-point decline in non-ERIC states. + Had an increase of just 0.10 percentage points in the use of provisional ballots–which are often issued to voters with problematic registration status; in non-ERIC states, the use of these ballots grew by 0.36 points. This report is quite significant in that it confirms many of the expected benefits of data-sharing between states to improve election administration. It will be interesting to see how these numbers change both as more states join ERIC and as existing states become even more familiar with the processes involved in managing exchange data. Congratulations to RTI and Pew for this report … and stay tuned! Be the first to comment on "RTI Report Says Pew’s ERIC Program Improves Voter Registration in Participating States"